Promotional offers include contests, giveaways, and gift basket! 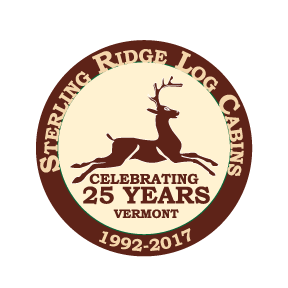 With its opening day dating back to June 1992, Sterling Ridge Resort marks its 25th year as a Northern Vermont mountain escape. What started as an 8 room bed and breakfast, has grown into a 370-acre property with 26 cabins, including trails for hiking, snowshoeing, a heated outdoor pool for the summer, 2 ponds to fish (one stocked with trout yearly), and much, much more! To celebrate its silver jubilee, the resort will be launching several promotions throughout the year, including special gift baskets and giveaways for guests who stay on the 25th of each month and who are celebrating a 25th anniversary, and a contest centered around past romantic experiences at Sterling Ridge. Launching around Valentine’s Day until March 14th the resort will run a contest, asking current and past guests to share a romantic tale that they’ve had while staying at Sterling Ridge. The top story will win a weekend getaway (a 2-night stay, with restrictions). Contestants are asked to share their story on Facebook, Twitter or Instagram using #sterlingridgeromance. The winner will be selected on our official anniversary date in June 10, 2017. Highlighting the importance of this year’s superstar number, 25, the resort will present guests who stay on the 25th of each month with special giveaways. Couples who are also celebrating their 25th anniversary with the resort will receive a complimentary Anniversary Gift Basket filled with select goodies to increase the romance of the stay. “We have made wonderful friends along the way that have helped us by being repeat customers and by referring family and friends to visit the resort. Celebrating our 25th year would not be possible without our guests, and this promotional year gives us the opportunity to say “thank you” for staying with us, whether multiple times or only once,” explained the Petersons. Founded originally 1989, was purchased by Scott & Sue Peterson in 1992 and transformed into Sterling Ridge Log Cabins in 1995. Sterling Ridge is a log cabin resort situated on 370 acres down a scenic back road in Northern Vermont. While staying, guests can enjoy the peacefulness of the countryside in one of our 26 secluded cabins. The four season Resort is a perfect choice for getaways, reunions, weddings, and family vacations. Visit www.sterlingridgeresort.com for more information!